If you want a delicious, savory and sophisticated breakfast this weekend, whip up a batch of these gingerbread pancakes. 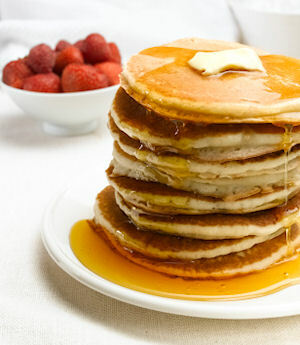 Coffee, brown sugar, cinnamon and ginger make these oh-so-sweet pancakes a memorable way to start any morning. Serve drizzled with maple syrup and enjoy with a cup of piping hot coffee for a delicious meal any time. In medium bowl whisk together milk, coffee, butter and eggs until evenly blended. Set aside. In large bowl sift together all-purpose flour, whole wheat flower, sugar, baking soda, baking powder, salt , cinnamon, ginger, nutmeg, and cloves; pour egg mixture into flour mixture stir until just combined. Set aside for 10-15 minutes. Heat lightly greased large griddle or skillet over medium heat. Scoop large spoonful of batter onto hot pan and fry until bubbles appear on sides. Flip and cook until browned on other side, continuing until all batter has been used. Serve hot.